Lovejoy’s Applications Engineering team receives quite a few inquiries each year that are related to log splitters. Log splitter equipment typically consists of a small gasoline engine driving a hydraulic pump, often coupled together using a standard Lovejoy elastomeric jaw style coupling. Inquiries received by Lovejoy’s Applications Engineering team also are typically confirming the proper size spider replacement has been selected, and/or requesting help to select the ideal coupling size to use when replacing one of the log splitter components such as the hydraulic pump or engine. When replacing an engine or pump, changes in shaft size or engine horsepower are common and the coupling size may change. It is common knowledge that gasoline engines, regardless of size, can be very tough on couplings. The pulsing from the compressing and burning of the fuel sets up a vibration in the engine called torsional vibration. The coupling needs to dampen some of this vibration while transferring torque from the engine shaft to the pump shaft. For this reason, both the coupling size and the type of spider, or insert material is critical to the successful performance of the coupling and the operation of the log splitter. If the coupling is not sized correctly, or the incorrect elastomeric material is selected, the coupling could fail prematurely, possibly as soon as the engine starts. To avoid this frustration, some common steps, or “rules of thumb” for selecting a jaw coupling for a log splitter have been included in this article. 1. To size a jaw coupling for a log splitter, it is necessary to identify the peak torque output from the engine being placed in service. 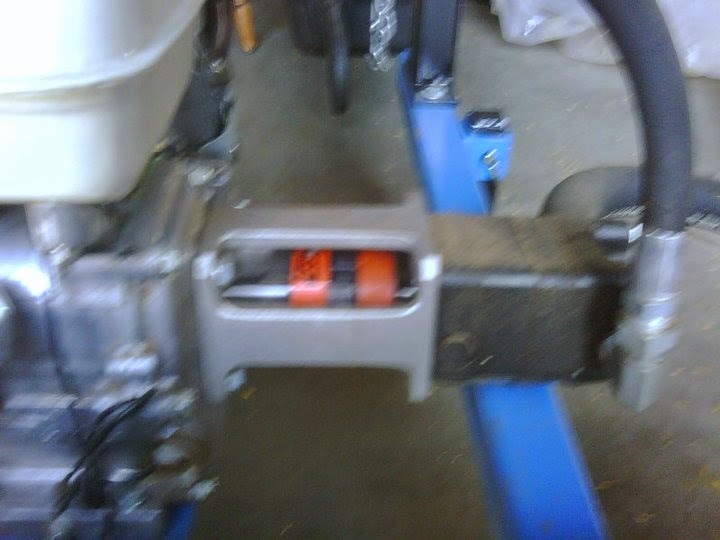 This peak torque can usually be found in the engine documentation that is supplied with the engine. This torque may appear in the form of a power speed curve chart as shown here, or could be provided by the small engine manufacturer as the “rated” speed at which the engine achieves the published horsepower. If a rated speed and horsepower is supplied, the following formula can be used to calculate the torque. 2. Multiply this published or calculated torque times a combustion engine service factor of 2.0 or greater to get what is called the selection torque. 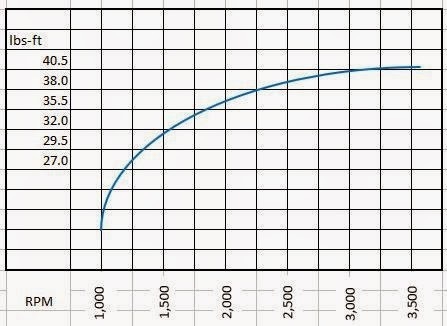 If the engine power speed curve as shown above shows a peak torque of 40.5 ft-lbs, or 480 in-lbs, the coupling selection torque would be 480 in-lbs x 2.0 = 960 in-lbs. If the engine manufacturer prefers to define the engine by horsepower at a rated speed, their data might define (example only) an engine capable of 23 horsepower at a “Rated” speed of 3,000 RPM, the torque would be 483 in-lbs. Selection torque would be 483 in-lbs x 2.0 = 966 in-lbs. Again, the rated speed and horsepower must come from the engine manufacturer or their published specifications. 3. The spider, or insert material for this application should be as torsionally “soft” as is available to dampen vibration and dissipate heat associated with dampening the vibration. The most torsionally “soft” spider material offered from Lovejoy would be the Nitrile Buna-N, or NBR (sometimes referred to as SOX) rubber. In addition, since log splitters typically run well in excess of 1,800 RPM, the spider would have to be a solid center spider. 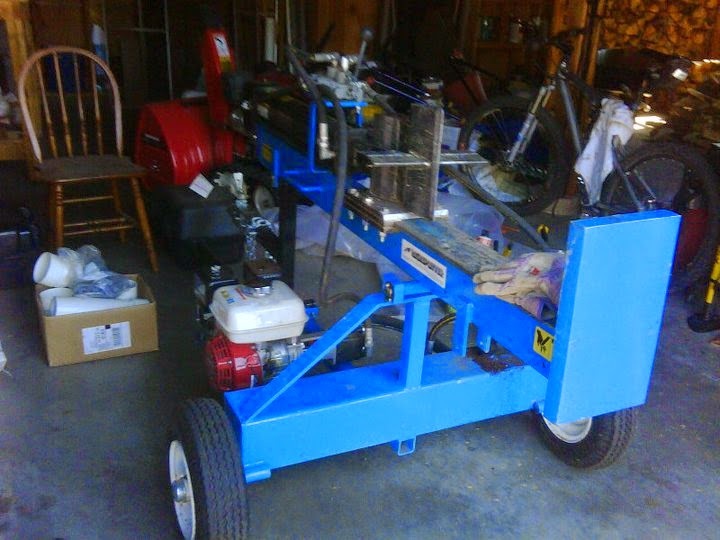 An open center spider will not hold together at the typical log splitter running speed. The maximum speed for each size jaw coupling is shown in Lovejoy’s on-line catalog. 4. In the Lovejoy jaw coupling catalog, find the coupling size and part numbers that match the shaft size for the engine AND the pump. Both of the hubs and the spider must be the same coupling size. If one hub is an L100 (example: L100 HUB 1” 1/4x1/8KW), the second hub must also be an L100. Likewise, the spider must be an L100 spider. For a log splitter application, the spider must also be a solid, or closed center type of spider. Sample engine: 18HP gasoline engine, rated at 3,200 RPM, 1” shaft with a 1/4” x 1/8” keyway, but will be running at 3,600 RPM. The hydraulic pump has a 3/4” shaft with a 3/16” x 3/32” keyway. The first coupling size in the catalog where the NBR spider torque rating will accommodate 709 in-lbs is the L110 size jaw coupling. The NBR rubber spider is rated for 792 in-lbs of torque which should be acceptable for this engine and pump combination. The solid center spider is designed to operate at speeds up to 5,000 RPM which is more than enough for this log splitter application. From the catalog, the spider part number would be 68514411724 (see page JW-10 in the catalog), the hub for the 1” engine shaft would be part number 68514411739 (see page JW-11), and the hub for the 3/4” hydraulic pump shaft would be part number 68514411735 (see page JW-11). Please note that Lovejoy also supports an assortment of splines. If the motor or pump has a spline shaft, please feel free to contact Lovejoy Customer Service for details regarding which splines are supported. Care should be taken to ensure the shaft separation matches the gap dimension for the spider selected. The chart on page JW-24 in the Lovejoy catalog shows a ‘G’, or ‘Gap’ dimension for each size coupling. Since the solid center spiders will not allow a shaft to extend inside the spider, the shaft separation must be equal to or greater than the gap value shown. If the shaft separation is greater than the ‘G’ dimension, the hub(s) can hang off the shaft a small amount. The ‘rule of thumb’ for hanging a hub off the shaft is the hub/shaft engagement should be as close as possible to, or more than the diameter of the shaft. If this is not feasible with your equipment, the engine or pump may need to be moved to allow for proper spacing. 1. The spider, or insert should be NBR (SOX) rubber spider with a solid center. 2. Use the “Rated” torque for the engine as supplied by the manufacturer. 3. If “Rated” torque is not available, use the engine manufacturer’s “Rated” horsepower with the “Rated” speed to calculate the engine’s peak torque. 4. Calculate the selection torque by taking the engine’s peak output torque and multiply this torque times a service factor of 2.0 or greater. 5. Contact Lovejoy Technical Support at 630-852-0500 with any additional questions or concerns. Please note that recommended procedures and techniques for performing jaw coupling installations can be found in the installation guides and demonstration videos available at Lovejoy's website. To find a quality authorized Lovejoy distributor, please see Lovejoy's Find a Distributor tool. About the Author: Bob Buesing has a rich legacy of serving Lovejoy and Lovejoy's clients as a coupling application engineer and product trainer. To tap into Bob and Lovejoy's rich industry knowledge and experience, please contact call (630-852-0500) or email Lovejoy and request to speak with an application engineer.